In the Netherlands we love Dutch cheese. At lunch and breakfast we often eat a sandwich with a spread of butter and a slice of cheese. We eat it as a snack at parties and we often use it in our dinner. Yearly we make about 750 million kilograms (165 million lbs) of cheese in the Netherlands. That is the same weight as about 100.000 adult African Elephants. Two thirds of this is used for export. An average Dutch person eats about 17 kg (37 lbs) per year. The earliest traces of cheese making in the Netherlands have been dated 800 bc. Archaeologists have found pots with small holes in them, indicating the making of cheese. Milk would be put in an ceramic pot for a about a week and then placed in the pot with holes so only the thick part (curd) of the milk would remain. The curd could dry and form the base of the cheese. In the Medieval times the Dutch started exporting cheese products on a large scale. In the Dutch Golden Age (17th century) when the Dutch prospered in their trade, art and science, the Dutch where known as a ‘Kaasland’, cheese country. The Dutch are Cheese heads! The Dutch name for cheese is ‘kaas’ and the dutch people are often called ‘Kaaskoppen’, meaning cheese heads. A ‘kaaskop’ is a wooden mold where the cheese is shaped in. One story says that when Napoleon invaded the Netherlands in the early 19th century, the Dutch farmers picked up their pitchforks and wore these wooden cheese molds as helmets to fight of the soldiers. The most famous cheese from the Netherlands is Gouda cheese. It is named after the town of Gouda. Cheese is not produced in Gouda. But Gouda had a big cheese market where the cheese from the Netherlands is traded. 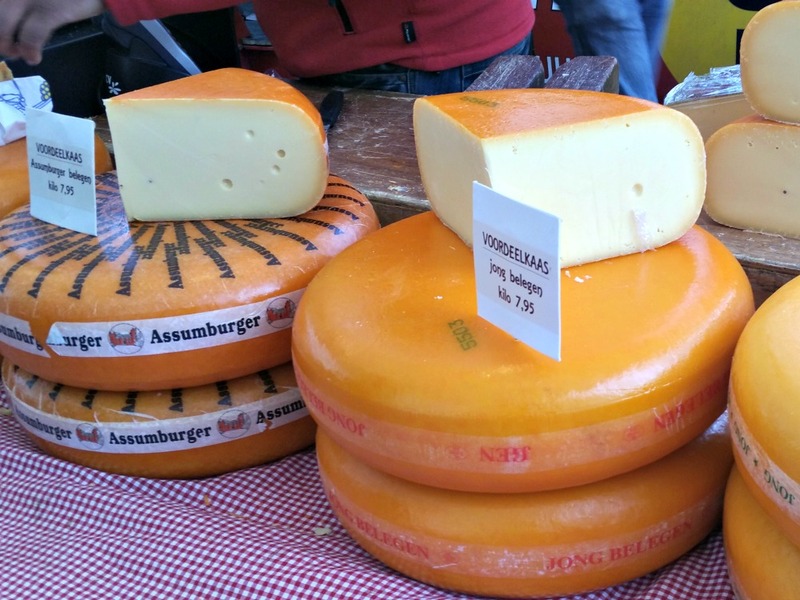 The traditional market in Gouda is still happening on Thursdays from April till August. Search the Gouda website for the ‘Gouda Cheese Market’ updates on date and times. Nearby Amsterdam is the town of Alkmaar. There the cheese market has become even more of a tourist attraction. In Alkmaar you can also visit the Cheese Museum. Read more about Alkmaar, the Dutch capital of cheese. ‘He has not eaten any cheese from it.’ (‘Hij heeft er geen kaas van gegeten.’). Meaning: He does not know anything about this subject. ‘He wont have his cheese eaten from his bread.’ (‘Hij laat zich het kaas niet van zijn brood eten’). Meaning: He won’t let anyone take, what is rightfully his.